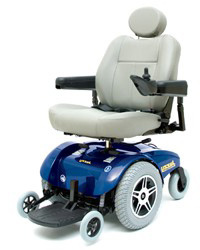 The Jazzy® Select 14 delivers the advantages of patented mid-wheel drive for maneuvering in tight, compact spaces. Loaded with performance and convenience features, like a powerful 50 amp, PG VSI controller, larger batteries for 30% greater per-charge range, a 300 lbs. weight capacity and an on-board battery charger, the Jazzy Select 14 is as east to use as it is to enjoy. Plus, it offers an XL package that has a 350 lbs. weight capacity, contoured seating as large as 22 inch w x 20 inch d and 14 inch solid tires.